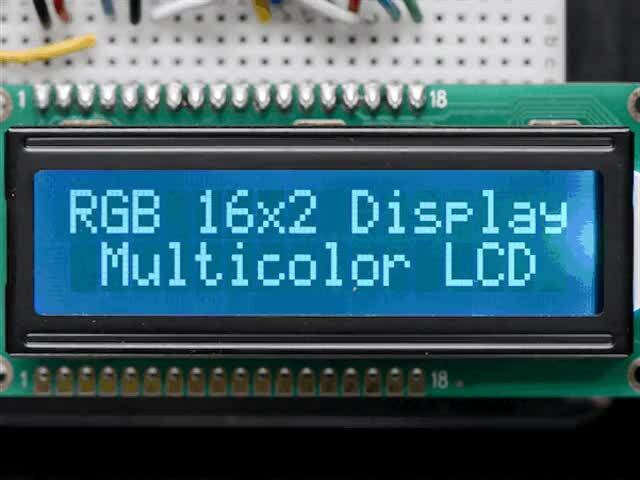 Adafruit carries many character LCD display varieties with multiple sizes and backlight colors. The Adafruit I2C / SPI character LCD backpack allows you to control these displays by sending data over the two wire I2C interface. 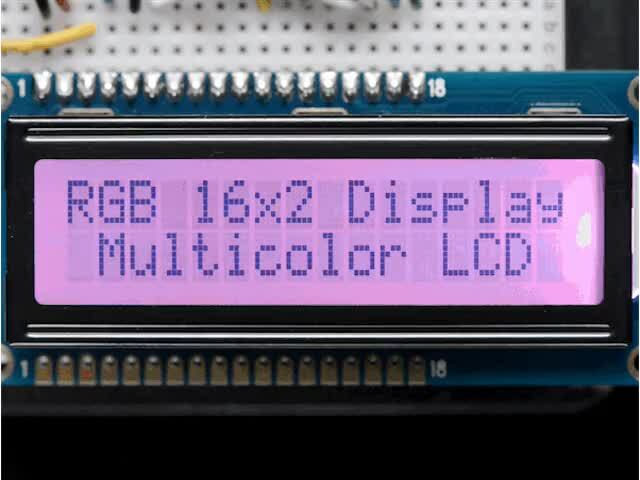 Standard LCDs require a large number of digital pins, straining the capability of even an Arduino Uno. Use of the I2C backpack reduces the pins needed considerably. This project features a 16x2 display, displaying temperature and humidity without using a great deal of memory (important on a small microcontroller like Trinket). The I2C backpack may be assembled and placed on the back of the display. See the guide to backpack assembly to prepare your display and the backpack. The color displays have a couple of extra connectors - pins 16, 17, and 18 control the three color backlights. If you connect pin 16, the I2C will control the red light. You can choose to put a jumper from one of the backlight pins to backpack pin 16 to choose a different color or connect the pins high to keep them on all the time. Making the pin choice before soldering on the backpack allows you the most flexibility in choosing your backlight color. To test the display, wire the DAT pin to Trinket GPIO #0, the CLK pin to Trinket GPIO #2, 5V to the Trinket 5V line and GND to GND. Use the Fritzing wiring diagram on the previous page to check your wiring. Ensure your Arduino IDE has been configured to program the Adafruit Trinket 5V 8 MHz for the Hello World test program (note for later: we will be changing this to Trinket 5V 16 MHz for the sensor program). The display test program is a variation of the Hello World program. You need to install the Adafruit_LiquidCrystal library mentioned on the previous page. Ensure you configure the Arduino IDE software for Trinket as noted in the tutorial Introducing Trinket. Also select Trinket 5V 8 MHz in the Arduino Tools menu. lcd.print("hello, world! ");  // Print a message to the LCD. If you plan on having more than one LCD or I2C device, see Changing the I2C Address for details. What if I have no display? Using the contrast potentiometer on the backpack (a small silver bump), turn the dial with a small screwdriver. Change the contrast until you can read the text. Once you have the display connected to the Trinket, you can expand the project in many ways. One of the most popular is to add sensor(s) of some sort. 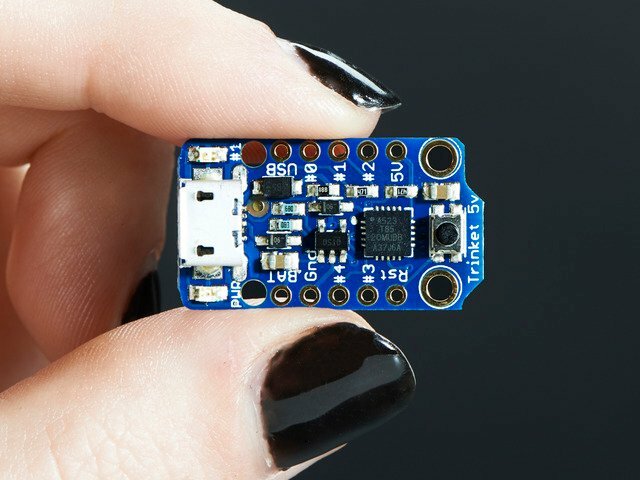 The Adafruit store has a wonderful selection to chose from. The easiest place to add a sensor is to Trinket GPIO #1. GPIO pins #0 and #2 are used for the display and #3 and #4 are shared with the USB port. Using #3 and #4 is perfectly fine, but you may have to disconnect the connections on those pins when uploading software. Also, limiting a project to pins #0 to #2 gives you a similar pinout to the Adafruit Gemma wearable controller. This project demonstrates using the DHT22 temperature and humidity sensor. It provides a 0-100% humidity reading with 2-5% accuracy and -40 to 80°C temperature readings with ±0.5°C accuracy. The sensor only requires one digital pin for readings, perfect. You may want to review the Adafruit tutorial on DHT sensors for more background. You may ignore pin 3, its not used. Place a 1K ohm resistor between VCC (5V) and the data pin to act as a pull up on the data line. Do not use the 10K resistor normally used from 5v to the data pin. Trinket GPIO Pin #1 is shared with the onboard red LED. 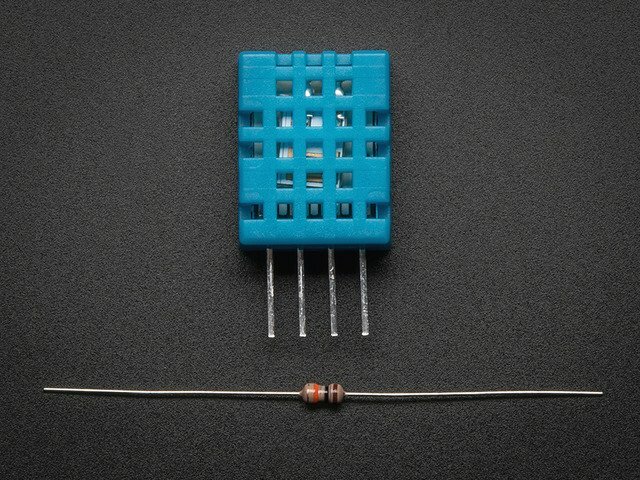 Connecting the DHT, the sensor requires a 1,000 ohm pullup resistor (not provided) between Trinket GPIO #1 and 5V to pull up the voltage to be read by the Trinket. Be sure to set your Board type as Adafruit Trinket 5V 16 MHz, and Programmer as USBtinyISP in the Arduino IDE under the Tools menu. This is a change from many Trinket programs which were run on 8 MHz, take note. To get the timing correct on the DHT sensor, the Trinket is clocked to 16 MHz (same as the Arduino Uno) in the first line in the setup() routine. This requires the 5V Trinket as the 3 volt Trinket is not guaranteed to function at 16 MHz. This also limits use to Trinket and not Gemma. The above code compiles to 4,760 bytes of 5,310 available. This leaves 550 bytes of code if you wish to add additional functionality. Note that adding display text will use the available space quickly. Also, if you use decimal (floating point) numbers, you will most likely exceed the space available. The Arduino IDE built-in functions to do floating point math are somewhat large (this is why the DHT library was edited to create the TinyDHT library: to use integer math, which limits precision to one degree and one percent but saves space). If the display is not showing values you expect, ensure you compiled it with the board being the Adafruit Trinket 5V 16 MHz (not 8 MHz). Also check the sensor wiring. Ensure you have installed Trinket support in your Arduino IDE as listed in the Introducing Trinket tutorial. Ensure you have installed the TinyDHT, and Adafruit_LiquidCrystal libraries listed on the first page of this tutorial. The Adafruit standard DHT and the Arduino LiquidCrystal libraries will not work. Ensure you push the Trinket on board reset button before uploading your sketch, the red LED will blink when ready for upload, there is a 10 second window to do this. If you place a large amount of code or other libraries in a sketch, it is very easy to exceed the available code space on the Trinket. 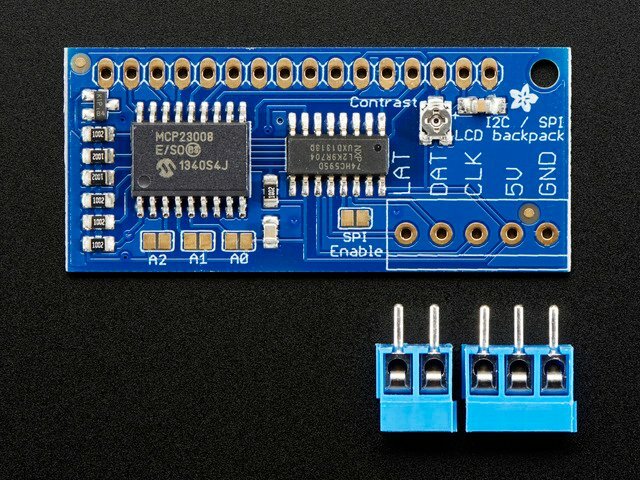 If your program absolutely will not fit, consider switching to an Arduino Uno, Adafruit Boarduino, or Adafruit Flora with standard libraries. If you get errors similar to the one below, you may have included decimal numbers and the floating point library was added by the Arduino IDE, exceeding the amount of program space available. If you get no display, go to the Hello World I2C sketch and ensure that works. If you have no display on Hello World, on the I2C backpack, use the contrast knob to change the LCD display contrast to a readable level. If you decided on an external potentiometer to change contrast and not pin 16 on the backpack, use that. If you get "Bad Read on DHT", the sensor is not talking to the Trinket correctly. 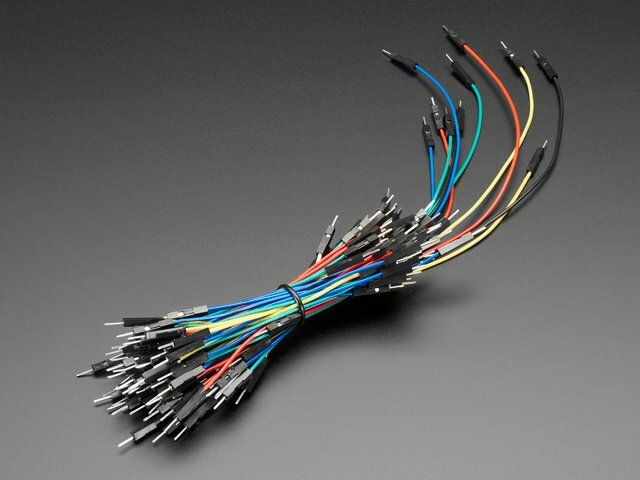 Check your wiring and ensure you have a 1,000 ohm resistor from Trinket GPIO #1 to 5V. 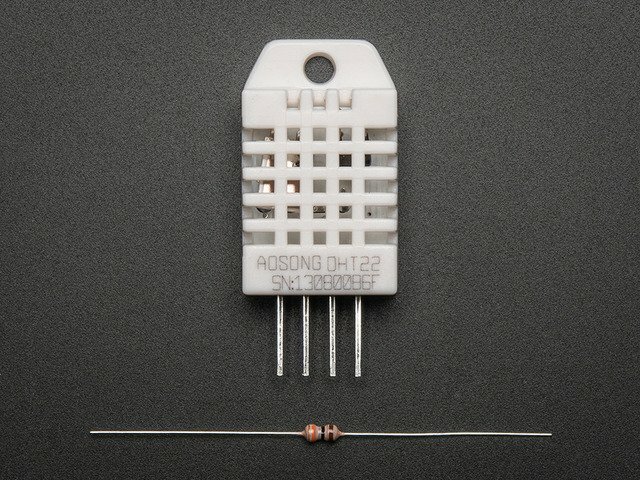 Resistors are commonly available at electronic stores on line and at retail locations like RadioShack. If you get 0% Humidity and 32 degrees F/ zero C, ensure Trinket 5V 16 MHz is selected as the Board type in the Arduino IDE Tools menu. The sensor code will not give correct readings on a Trinket 3V or at 8 MHz. You can change the temperature sensor to a TMP36 or other sensor with some changes. GPIO #3 is analog pin A3 and GPIO #4 is analog pin A2 for reading analog sensors. But be sure you do the conversion from the analog level to temperature using integer math (best to use an int16_t integer size) to avoid linking in the big floating point library for only a few calculations. A light sensor such as a cadmium sulfide photocell could be read, as in the Trinket / Gemma Mini Theramin, on GPIO #3 or #4, for a simple light meter displayed on the LCD display. Once you have the display basics, you can use these technique as the human interface to a wide array of projects. This guide was first published on Sep 28, 2013. It was last updated on Sep 28, 2013.